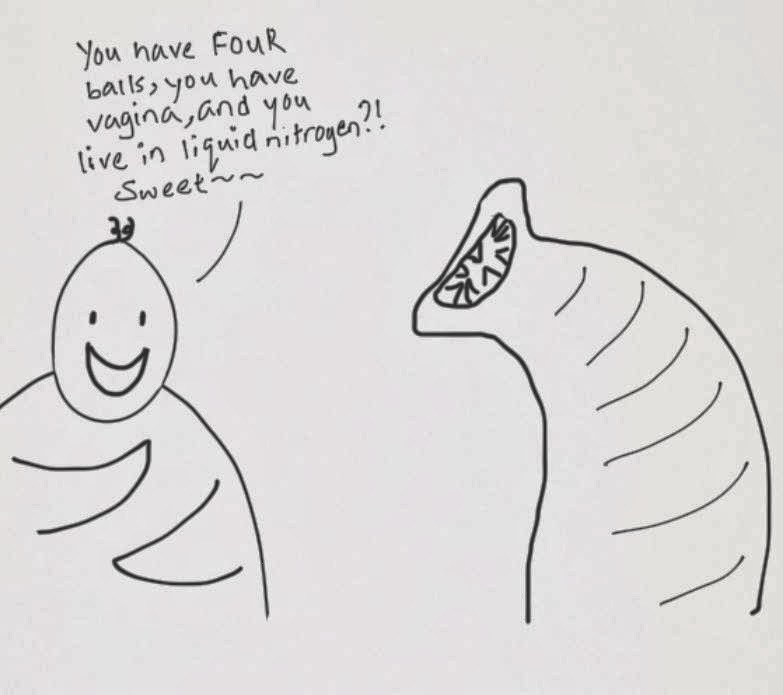 I'm Curious Too: Ask A Leech: How Do You Survive A 24-Hour Submersion In Liquid Nitrogen? Ask A Leech: How Do You Survive A 24-Hour Submersion In Liquid Nitrogen? How much cold can you withstand? The coldest place I've ever been to was -3 ⁰C. I didn't last beyond an hour. In August 2010 the coldest temperature ever recorded on Earth was measured in Antarctica; it was a staggering -94.7 ⁰C (though it was not an official record because it was measured by a satellite). And we arrogant humans thought that well-wrapped humans are the only living beings capable of surviving the cold. But try put Ozobranchus jantseanus, a small parasitic leech of freshwater turtles in East Asia, in the coldest spot in Antarctica right now; it'll probably just shrug it off as if nothing had happened. Image: A Leech Capable of Surviving Exposure to Extremely Low Temperatures, Dai Suzuki; Tomoko Miyamoto; Takahiro Kikawada; Manabu Watanabe; Toru Suzuk, PloSOne 2014. The thing is, this little parasite can survive for up to 24-hours in liquid nitrogen. That's -196 ⁰C. Oh dear. Most creatures cannot survive very long below 0 ⁰C because of the damage caused by the water in cells as it freezes. What's even more amazing is that every single leech placed in -90 ⁰C storage survived for nine months, and some even survived for 32 months. That is by itself a tremendous feat compared to other cold-tolerant animals. Bedbugs, for instance, can only survive for up to 80 hours at about -16 ⁰C, or for 48 hours at about -20 ⁰C. And the leech can even withstand being rapidly chilled to -196 ⁰C and put straight back to room temperature, repeated up to 12 times over a couple of minutes. This is very unusual because unlike other cold-tolerant creatures the leech doesn't need gradual acclimatisation. Moreover, this leech thrives in East Asia, which is not very cold compared to the poles. So why does it possess the adaptation to survive temperature way below those found on the surface of the Earth? And I'd be interested to know if the author decided to put the leech in liquid helium next..
Go ahead and read the full paper here.